If your guitar looks sort of like this and says Gibson, I want it. 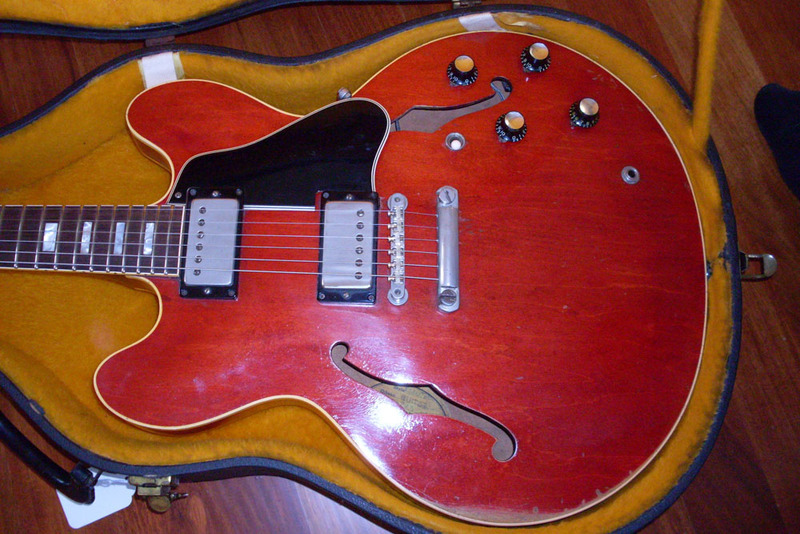 This is an ES-335. 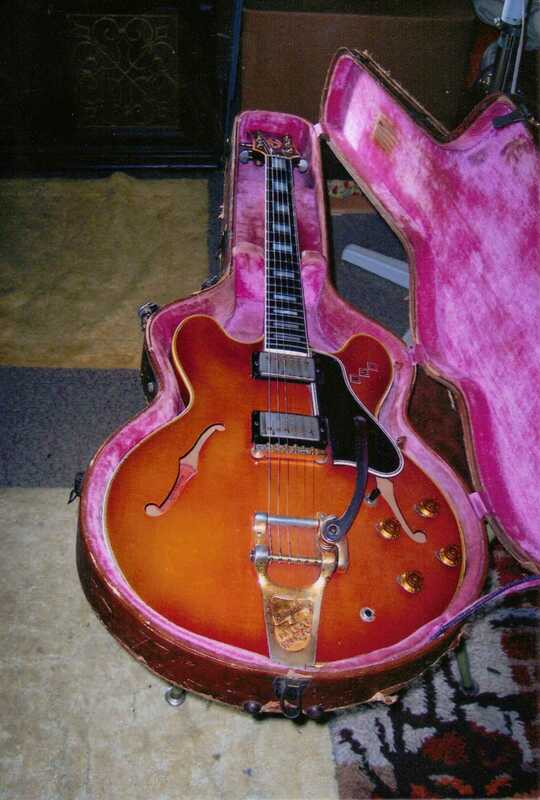 This is an ES-345 with a Bigsby tremolo tailpiece. It is typically worth a bit less than a 335 unless it is finished in natural like this one. The Bigsby tailpiece takes 25% off the value as well. I want these, too. If you have an old one that looks like this or like this with a gold finish, I’m interested in that as well. 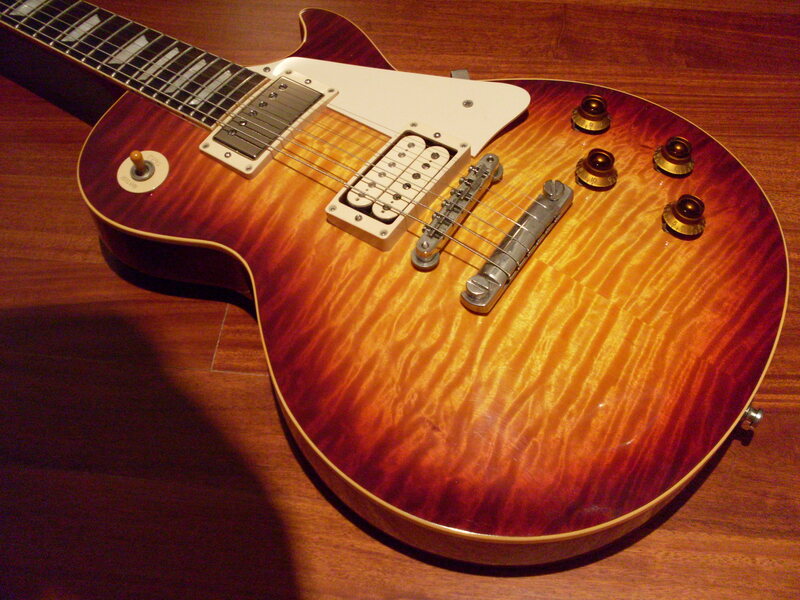 This is a Les Paul model. If you have one that looks like this and is old, I might be interested as well. 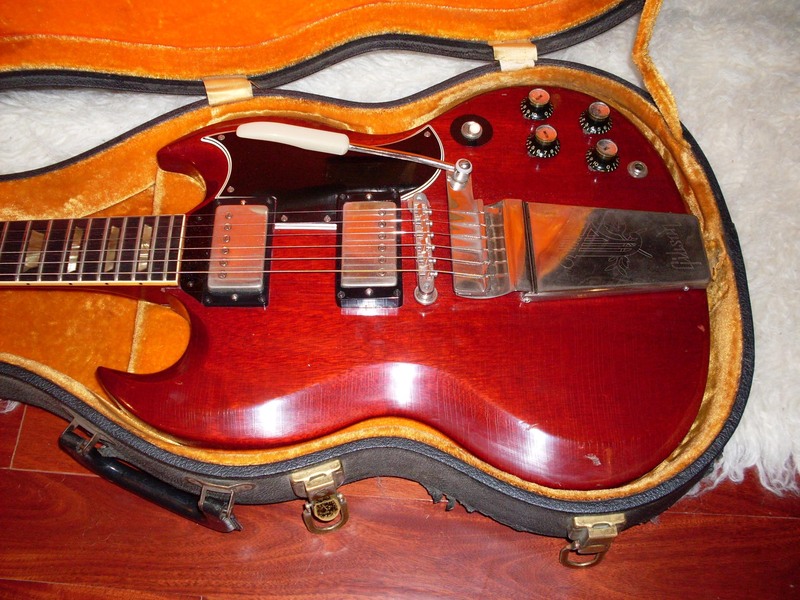 This was also called a Les Paul model between 1961 and 1963 but was later called an SG. If you have one made between 1961 and 1965, I’ll be buying that too. 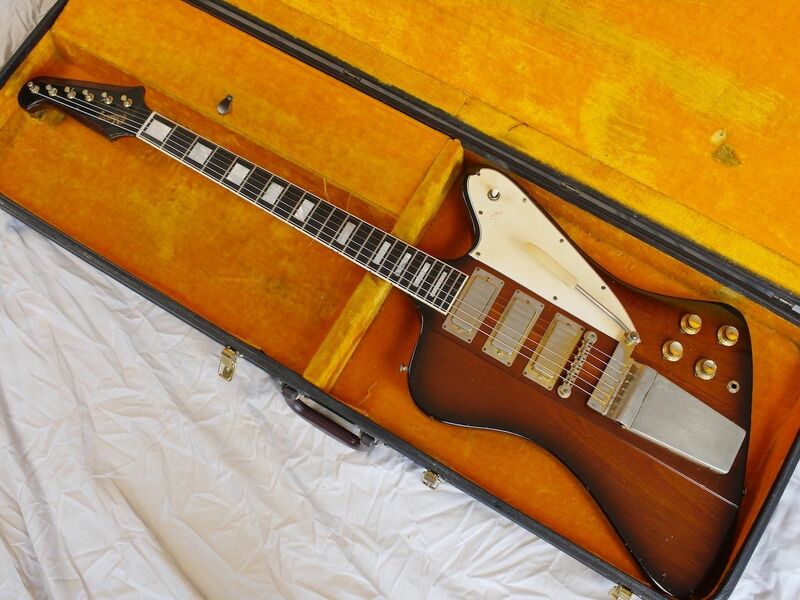 This is a “reverse” Firebird. If you have one that looks kind of like this (it can be one two or three pickups), I’ll be interested in buying it. These were only made from 1963-1964 with a few shipped in 1965. It has been reissued. I am not interested in the reissues. I have a Gibson 345 but not sure of the year. 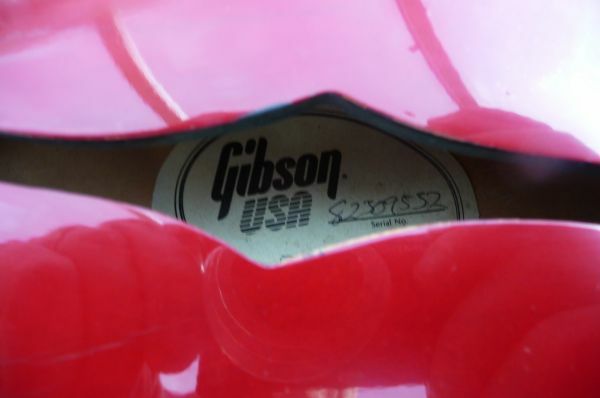 The serial # is 052229 Its hard to determine for sure what year that is from the gibson website. It has a headstock repair and in very good condition. Trying to find out what it might be worth. There are a lot of changes made to that guitar. A headstock repair cuts the value by 40-50%. The changed bridge, the added ( and incorrrectly positioned) stop tail, changed pickups all affect the value. It appears to be a 67. I would value it at perhaps $2000. Maybe less. Depends on how bad the break is and how well repaired it is. Email me at okguitars@gmail.com. Include a photo. 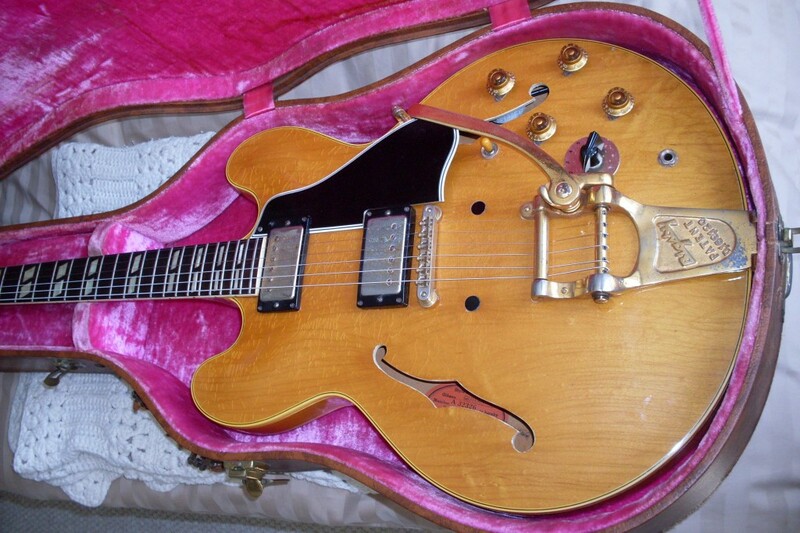 I’ve a question about a Gibson ES 345 TD serial number 06104338. What do you think about the year? I have a friend’s ’63 es335. The headstock was cracked off and reattached and a couple of the tuners have been replaced, with one a bit bent. The trapeze tailpiece was swapped out for a stop tailpiece (original screw holes sill visible). The guitar plays and sounds like a million bucks. Do these type of inperfections greatly reduce the value? Thanks. I thought as much. The key for me, as a player, is that this guiter really delilvers. I run that through a “57 Fender Pro and it’s gold. This probably isn’t appropriate for this thread, but I respect your opinion. 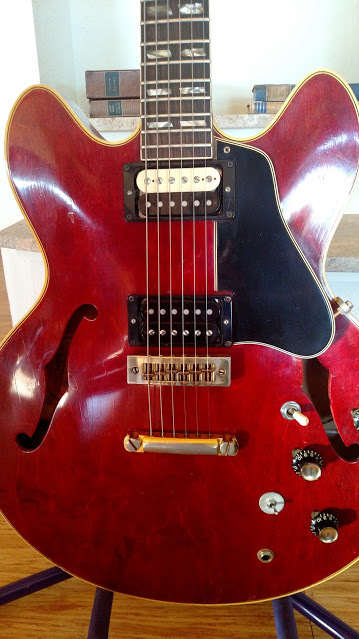 If I wanted to create a legacy for my son, would I be crazy to by a custom shop 335 new? Thanks for the feedback. Perfectly fine but if you buy, say, a 65, you get a 50 year head start and a guarantee that it will always be more valuable than that custom shop 335. An average 65 (big neck) is a few thousand more than a top of the line new custom shop 335. A 63 wouldn’t ever have had a trapeze, so it probably isn’t a 63. Trapeze started in 65. Broken headstock if well repaired takes about a 40% bite out of the value. The tuners make very little difference since you can always find vintage correct tuners. You cannot, however, unbreak a headstock. How are you, I’m in a situation where i must sell my fathers 1967 Gibson es335. Its in great shape give it a 7 out of ten. It was a 12 string converter to 6, but still have original hardware for the 12. Ie tuners…please let me know if you are interested. It wouldn’t be a guitar I would buy. I generally buy 335’s from 65 or earlier. I might have been interested if it was still a 12 string. You’ll do better selling it on the open market. A well done conversion shouldn’t be too hard to sell. That would be a 2004 using Gibsons current system of numbering. They did some weird stuff with serials in the 70’s so if it looks much older then I would need to see a photo. 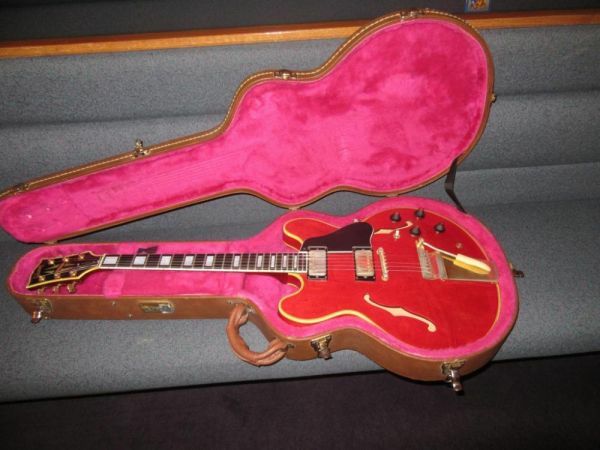 I have a 1965 cherry 335 that I have owned since new. It’s in good condition for the year, although it seldom comes out of it’s case these days. I may be interested in selling if the price is right. Contact me if you are making a serious offer. Hi, Am looking at buying a ’63 335. It’s being discussed on TGP and someone recommended I contact you as a good indicator of what it’s worth? 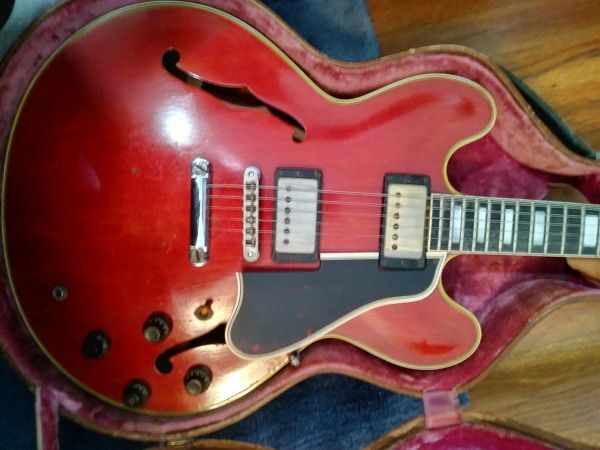 I have a near mint 1967 ES 335 for sale. Thin neck. All original with no mods but one. 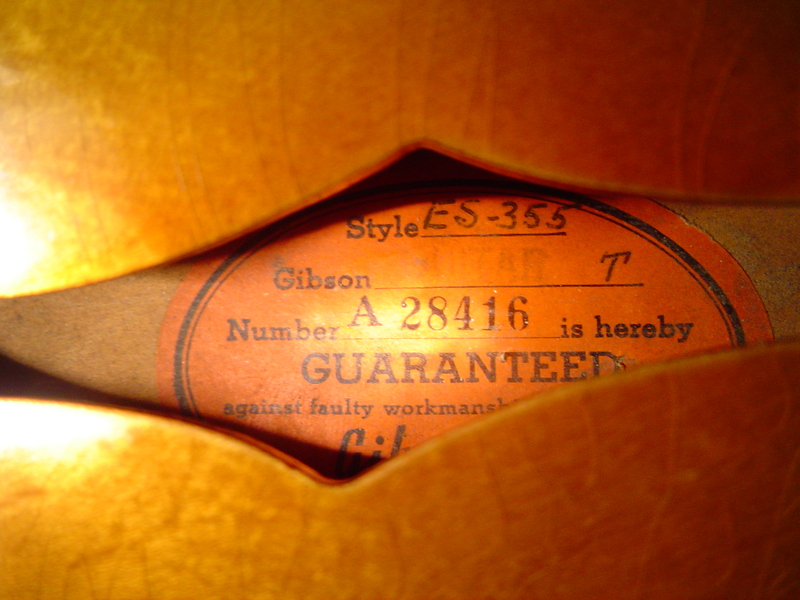 The first owner sent it back to Gibson to have them apply a stinger to the back of the headstock. No repairs made just the stinger painted and I have the original paperwork for the work. The finish shows checking as to be expected but there are no cracks, scratches, etc. Sunburst finish and non gibson but period correct case included. Photos upon request. Send me an email at okguitars@gmail.com. Include a photo of the front, back, headstock (front and back). Thank you. I don’t buy many post 64 335’s but sometimes I do. I’m good but not that good. The phrase “people keep saying” has come to mean “nobody is saying this but I am” You can thank our president for that. Send me some photos. I can tell you only that the label looks right. I would guess that nobody would bother counterfeiting/faking an 89.
here are some pics as I didn’t seem to get them in the 1st time……. damn I hate computers! totally the wrong pic!!! 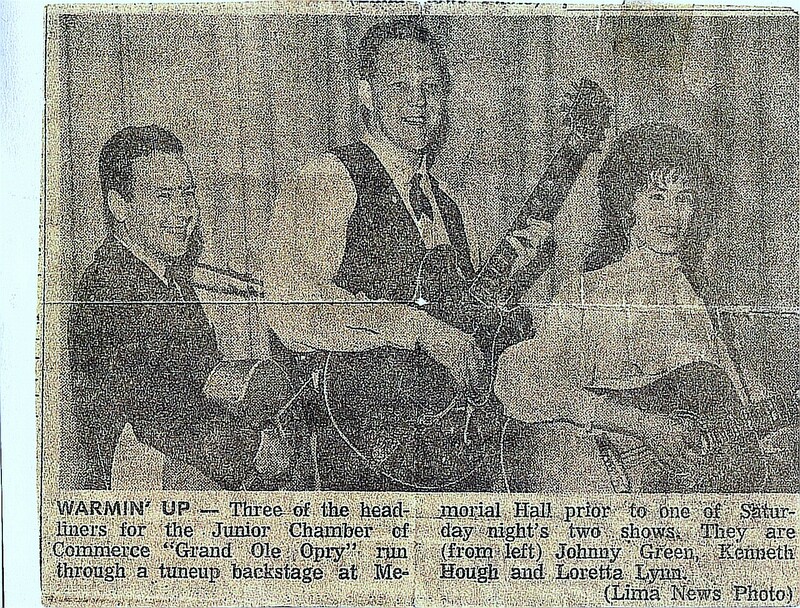 a full on pic, maybe…..
Great guitars. Sadly, there are some unfortunate modifications. Slightly misplaced stop tail (low), Nashville bridge. Even with the mods, it’s probably a great player. Hi, I was hoping to sell my 335, but I see you’re only interested in 65 or older. I have a 1978 ES-335 CRS in black, all original in very good shape. CRS is country rock stereo, so it’s a bastardized version, or maybe not even the same thing. I read that only 350 were made. 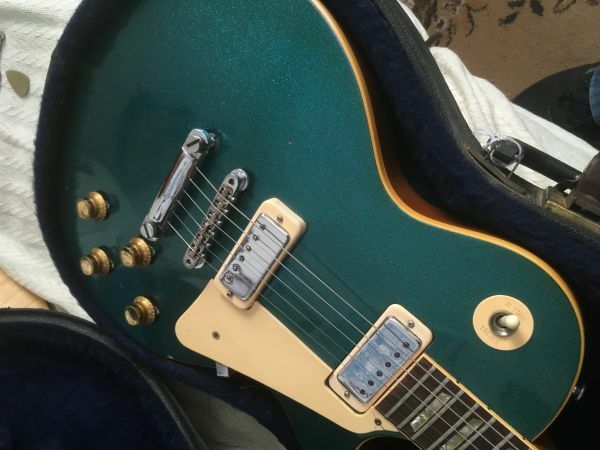 Any thoughts on this guitar as far as value, rarity, desirability, etc…? I would assume you’re a busy person answering all of these messages but I’d love to get any insight from you. Thanks so much, you are doing a great thing here! A black 78 CRS would probably not be too hard to sell. They aren’t terribly valuable but its of folks like black guitars (like me). Send me some photos-I can’t evaluate anything without a photo of the front, the back and the headstock front and back. This 1967 es335 has a stop tail conversion and tuners replaced. Otherwise it is original and in great shape. Any ideas an a ballpark price? Would it be a good idea to put period correct tuners and a trap/bigsby with the custom plug on before I tried to sell it? You should be able to sell it as is. Most folks prefer the stop tail to the trapeze and whoever did the conversion is only off by maybe a quarter inch (too low). The knobs are also changed. You could swap the tuners back but the loss of value from Grovers is permanent since the shaft holes were enlarged. I’d just leave them. Not sure that bridge is right either. Hard to tell in a small photo. I can’t really assess the value from a single small photo.